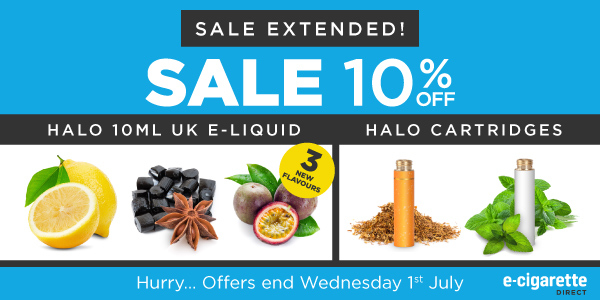 Today you can get 10% off Halo 10ml UK e-liquid PLUS Halo cartridges. No coupon needed – to take advantage of the sale simply visit the sale page and add to cart. Apologies – there were some errors on the weekend with the discount code, so the sale has now been extended to Wednesday 1st July. 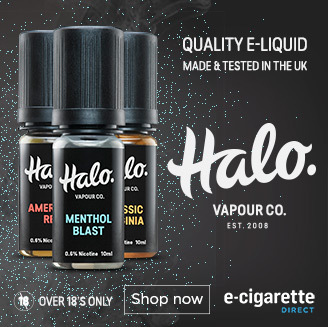 Our mixologist has been freshening up the Halo range with some delicious e-liquids! Black Jack: Delicious full-bodied taste of aniseed delivering a smooth and nostalgic vape. Passion Fruit: A pleasantly sweet taste with a zesty citrus tang. Lemon – New and Improved: Popular zesty lemon e-liquid, and it’s now more delicious and tangy than ever! Super Tank Sale & New Eliquid Flavours!